The picture was taken in Boomland (Kart Racing in MANILA, PHILIPPINES) last 2007. 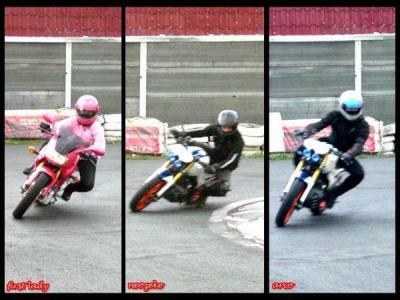 This is my first time to hit the track; quite small for a big bike(MOTORSTAR-EXPLORER Z200). It was fun though and exciting for a first timer in a track like me. I'm riding the pink bike. My real name is Teth J. Rayos del Sol but I'm known as "FIRST LADY" in MCP (www.motorcyclephilippines.com). First Lady since I a the first lady rider of MOTORSTAR EXPLORER Z200 BIKE / XPLORERS PHILIPPINES CLUB (www.xplorersphilippines.org). Good Day " First Lady ", in fact you are amazing ! By the way , Iam planning to order 1 xplorer Z200 ,Is the ABS brake system really working ? What is your comment about having xplorer Z200 ? In your experience on the race track , What is your max. speed ? How does xplorer Z200 responded once you throttled to high speed ? Join in and write your own page! It's easy to do. How? Simply click here to return to Biker Rally Pics.